It’s important to think about the size of your outdoor furniture. Is your outdoor furniture going to be used for your own leisure or hosting parties? (Maybe it will be used for both.) Consider table size and how many chairs will fit in your outdoor space comfortably. You don’t want people to feel like they are sitting right on top of each other nor do you want your outdoor furniture too feel huge as if you are on the set of Alice in Wonderland. The shape, size and padding of outdoor chairs is important. Think about the narrowness and how low the chair is compared to who is going to be using it. For example low furniture is difficult for older people to get out of. No one enjoys sitting in an uncomfortable chair. Make sure your chair has enough padding that will last for years. 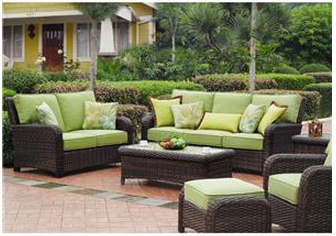 Outdoor furniture goes through a lot of harsh weather. Such as sitting out in the sun, wind and rain. This is why it’s important to purchase high quality outdoor furniture that is built to last. When thinking about quality, the type of material your outdoor furniture is made of is key. Quality doesn’t mean expensive. Aluminum, plastic and PVC are all relatively affordable. These materials are rustproof and lightweight. The benefit of purchasing aluminum, plastic and PVC is that they require very little weather treating. Natural wood is a nice strong and sturdy material. 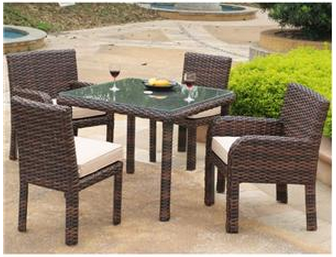 This sturdy material tends to be the most comfortable and attractive when it comes to outdoor furniture. Natural wood does require routine weather treatments such as UV protections. Teak, Redwood, Cypress and Cedar are typically the best natural woods for outdoor furniture. Wicker is not only stylish but it is a great material for outdoor furniture. Wicker is durable for the outdoors. Every couple of years wicker furniture should be waterproofed. Your outdoor furniture can be of great quality and comfort but if you are left in the scorching sun it can make sitting outside dreadful. Enjoy summer while it's here. An umbrella connected to outdoor tables or a small canopy above your setting are great solutions. Many outdoor furniture items have shade options like a umbrella or small canopy. Very nice blog! Thanks for sharing.